• The impact of college basketball's growing scandal hit the Pac-12 pretty hard yesterday, so much so even Bill Walton refrained from making jokes about it. Walton, the conference’s most unabashed supporter, was relatively restrained while doing to analysis of Arizona’s overtime defeat at Oregon last night. Why? 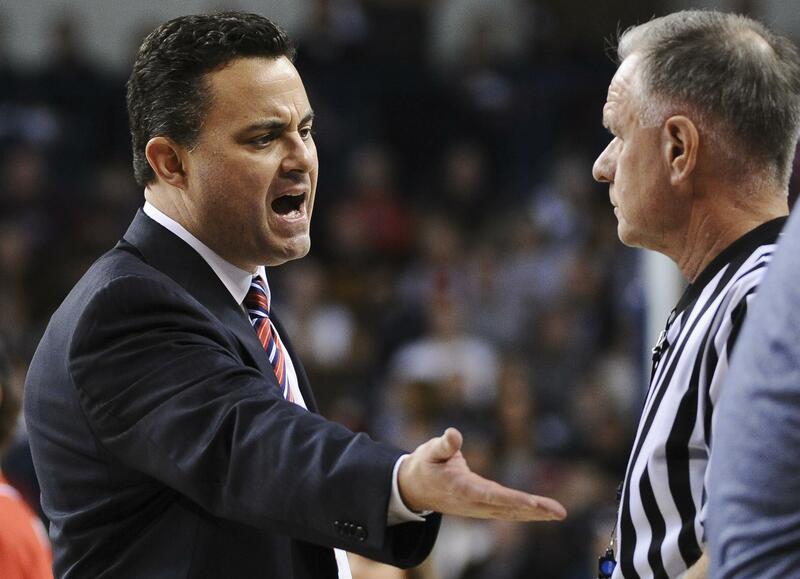 Mainly because Sean Miller, the Wildcat’s highly paid coach, was not on their bench. Instead, former Washington coach Lorenzo Romar ran the team (and insert your own “into the ground” jibe here). According to a press release, the school and Miller decided it was in everyone’s best interest if he didn’t coach yesterday, a day after ESPN reported the FBI has wiretaps of him talking about $100,000 and freshman star Deandre Ayton with a former agent. OK, it was mutual. That sounds, well, sort of implausible, but OK. So Miller didn’t coach. But Ayton, the best freshman in the conference and a sure-fire NBA top-five pick, did. Really? Let’s look at this critically. Why did Miller step away? Wouldn’t it make sense the university felt there was enough evidence available that his presence would cause trouble with the NCAA down the road? It is hard to believe any other explanation holds water. But the purported conversation was about steering Ayton to Arizona, buying his services so to speak. That can’t happen without someone connected to Ayton, in the NCAA-rule sense, being able to make it happen. That’s as big a violation as there is. Heck, what Reggie Bush’s family did wasn’t even close and that turned out real well for USC. If Miller was offering $100,000 for Ayton, as alleged, he was doing it with the expectation it would pay off. It would seem to any right thinking person the only way that is true is if there is some connection to the player or his family – though the family denies anything untoward happened. But the player was allowed to take the court. Is Arizona trying to have it both ways? Or are those in charge in Tucson – if there really is anyone – too scared to think correctly? If it turns out these charges are true, there will be hell to pay. At least the Wildcats won’t have to forfeit Saturday’s game. They lost that one themselves. • The bigger loss was in Pullman, where the school announced strength and conditioning coach David Lang died yesterday. I got to know Lang pretty well when he worked with the men’s basketball team during my time covering WSU. He was a no-nonsense guy when it came to dealing with his profession, epitomizing the two-sided relationship athletes have with their strength coach. The job requires pushing athletes to their limits and then through them. That isn’t easy. The faint of heart should not apply. But the job also requires you show the athletes how much you care. Those without heart should not apply either. Lang was both. He not only was willing to do what it took to help each individual player reach their potential, but he was able to communicate how much he cared – and he earned their respect because of that. Lang did his job well. He did it professionally. He did it with respect. He did it with compassion. And all of that was lauded last night on social media, as former WSU athletes he worked with told stories of how Lang had helped them. Some of the tributes were extremely touching. Sad, sure, but joyful as well. Memories of fun, memories of sweat, memories of joining together to reach a goal. They said goodbye. They sung his praises. But, in reality, they had already done the latter and had done it for years. Every time they stepped on a court or a field and performed at a level they could not have reached before, they were praising Lang and honoring his efforts. WSU: The Cougars came close to sweeping a conference road trip for the first time in Ernie Kent’s tenure, but Stanford was able to hold on, 86-84 at Stanford. Theo Lawson was there and he has this game story. There is more coverage from the Bay Area as well. … We have a story on Lang’s death. … Elsewhere in the Pac-12, there is a UPS truck full of news. We’ll start in Berkeley, where Washington picked up its 19th win of the season by handling woeful California, 68-51. … Down the road in Eugene, Oregon kept coming back against Arizona, helped a bit by a Romar technical, and defeated the Wildcats in overtime. The game didn’t lack in drama. And it served as a starting point for a lot of discussion about college basketball’s problems. … Utah lost to visiting USC 74-58 but that wasn’t the only thing that made coach Larry Krystkowiak mad. … Arizona State was darn good in nonconference play, winning against Kansas and Xavier. But the Sun Devils aren’t good right now. They lost at Oregon State last night and should be worried about the NCAA tournament. … UCLA and Colorado meet today. Gonzaga: If you are a Zag fan and you were worried about the game at BYU last night, it was wasted. The Bulldogs were locked in and shutdown the Cougars, winning 79-65. Jim Meehan was in Provo and has his analysis of the game as well as the three keys to the victory. … John Blanchette was also there and has a column from the tournament top seed-clinching win. … I wasn’t there but I did watch on ESPN2. That experience led to this TV Take column. … The guys in the office put together this highlights package. … I missed this column yesterday – as it was written by the boss man, editor Rob Curley, I hope I don’t get fired for that oversight – but it’s worth reading. … The women said goodbye to a couple seniors yesterday and then routed BYU. Whitney Ogden has the story on the Emmas, Stach and Wolfrum, and Jim Allen has the game coverage. … The win in Provo was a pretty big deal for that area’s media, so we have a lot of stories to pass along. … Around the WCC, San Diego went into San Francisco and handled USF. … Saint Mary’s had little trouble with Santa Clara. … Pacific led by 16 at one point but lost at Loyola Marymount. EWU: Bogdan Bliznyuk scored his 2,000th point and the Eagles held off host Idaho State, 74-69, for a key weekend road sweep. … The Washington legislature honored former Eastern athletic director Bill Chaves recently. … Elsewhere in the Big Sky, Montana thumped visiting Montana State and clinched a share of the regular season title. … Southern Utah defeated visiting Sacramento State. … Northern Colorado is still in contention for a top-four finish after winning at North Dakota. … Northern Arizona lost at home again. And new athletic director Mike Marlow, who came over from Washington State, is in the middle of a bit of a controversy. Idaho: The Vandals’ 68-62 win over Weber State last night not only moved UI into second-place tie with the Wildcats in the conference standings, it gave it the tiebreaker heading into the final week of the regular season. Whitworth: Twice Whitworth had taken on the nation’s No. 1 Division III team, Whitman. And twice the Pirates had lost. But Saturday night at the Northwest Conference postseason tournament in Walla Walla, with the game tied at 88, the NWC player of the year, Kyle Roach, assured there wouldn’t be a third time. Yet. With two seconds left, Roach caught an inbounds pass, split two defenders with the dribble and let fly from long range. Swish. Now the teams will wait to see if they will meet for a third time in the NCAA tournament. Chiefs: Spokane is on a roll offensively. It defeated Kootenay 5-3 last night in the Arena. Kevin Dudley was there and has this game story. … Around the WHL, Portland defeated Vancouver and Everett won its fourth consecutive game, though its coach wasn’t happy with the officiating. Preps: Let’s start with wrestling today, mainly because Post Falls High scored more points in the Idaho 5A state tournament yesterday than anyone had ever done, winning another state title. … There were other state winners out of North Idaho as well. … On the basketball court, Central Valley’s girls want another state title. That’s obvious. Dave Nichols covered their 54-17 win over Camas yesterday. … East Valley’s girls also won and advanced to state. Dave has that coverage as well. … We can pass along roundups from girls and boys action as state tournaments begin next week. Mariners: Dee Gordon caught a fly ball yesterday. Yes, that is news. … Mike Leake may be crucial for the M’s success. … There are injuries already. Sounders: There are reports out there Jordan Morris tore his ACL and will be out a long time. Published: Feb. 25, 2018, 9:21 a.m.